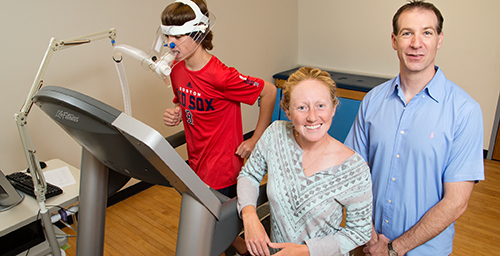 Kinesiology and community health professor Charles Hillman (right), postdoctoral researcher Laura Chaddock-Heyman and their colleagues found that physically fit children had more compact white-matter tracts in the brain than children who were less fit. CHAMPAIGN, Ill. - A new study of 9- and 10-year-olds finds that those who are more aerobically fit have more fibrous and compact white-matter tracts in the brain than their peers who are less fit. "White matter" describes the bundles of axons that carry nerve signals from one brain region to another. More compact white matter is associated with faster and more efficient nerve activity. 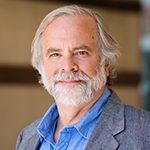 With his colleagues, Beckman Institute director Arthur Kramer found an association between physical fitness and the integrity of white-matter tracts in the brains of 9- and 10-year-old children. The team reports its findings in the open-access journal Frontiers in Human Neuroscience. "Previous studies suggest that children with higher levels of aerobic fitness show greater brain volumes in gray-matter brain regions important for memory and learning," said University of Illinois postdoctoral researcher Laura Chaddock-Heyman, who conducted the study with kinesiology and community health professor Charles Hillman and psychology professor and Beckman Institute director Arthur Kramer. "Now for the first time we explored how aerobic fitness relates to white matter in children's brains." The team used diffusion tensor imaging (DTI, also called diffusion MRI) to look at five white-matter tracts in the brains of the 24 participants. This method analyzes water diffusion into tissues. For white matter, less water diffusion means the tissue is more fibrous and compact, both desirable traits. The researchers controlled for several variables - such as social and economic status, the timing of puberty, IQ, or a diagnosis of ADHD or other learning disabilities - that might have contributed to the reported fitness differences in the brain. The analysis revealed significant fitness-related differences in the integrity of several white-matter tracts in the brain: the corpus callosum, which connects the brain's left and right hemispheres; the superior longitudinal fasciculus, a pair of structures that connect the frontal and parietal lobes; and the superior corona radiata, which connect the cerebral cortex to the brain stem. "All of these tracts have been found to play a role in attention and memory," Chaddock-Heyman said. The team did not test for cognitive differences in the children in this study, but previous work has demonstrated a link between improved aerobic fitness and gains in cognitive function on specific tasks and in academic settings. "Previous studies in our lab have reported a relationship between fitness and white-matter integrity in older adults," Kramer said. "Therefore, it appears that fitness may have beneficial effects on white matter throughout the lifespan." To take the findings further, the team is now two years into a five-year randomized, controlled trial to determine whether white-matter tract integrity improves in children who begin a new physical fitness routine and maintain it over time. The researchers are looking for changes in aerobic fitness, brain structure and function, and genetic regulation. "Prior work from our laboratories has demonstrated both short- and long-term differences in the relation of aerobic fitness to brain health and cognition," Hillman said. "However, our current randomized, controlled trial should provide the most comprehensive assessment of this relationship to date." The new findings add to the evidence that aerobic exercise changes the brain in ways that improve cognitive function, Chaddock-Heyman said. "This study extends our previous work and suggests that white-matter structure may be one additional mechanism by which higher-fit children outperform their lower-fit peers on cognitive tasks and in the classroom," she said. The National Institute of Child Health and Human Development and the National Institute on Aging at the National Institutes of Health supported this work. To reach Laura Chaddock-Heyman, call 217-300-0746; email lchaddo2@illinois.edu. To reach Art Kramer, call 217-244-8373; email a-kramer@illinois.edu. To reach Charles Hillman, call 217-244-2633; email chhillma@illinois.edu. The paper, “Aerobic fitness is associated with greater white matter integrity in children” is available online or from the U. of I. News Bureau.